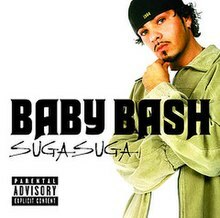 "Suga Suga" is a song recorded by American rapper Baby Bash, featuring Frankie J. It was released in August 2003 as the second and final single from his album Tha Smokin' Nephew. It is Baby Bash's highest-charting song at number seven, on the Billboard Hot 100 and charted on many international ranking, including number one in New Zealand. The song was written by Baby Bash, Stewart Magee, Frankie J and it samples "I'm Gonna Love You Just a Little More Baby" by Barry White. In turn, it was sampled in the Robin Schulz song "Sugar" in 2015. "Suga Suga (Reggae Remix)" is featured in the 2005 film Be Cool. The music video filmed in New York City, shows Baby Bash and Frankie J in a car stuck in traffic, Frankie J turns on the radio. A delivery woman in a low cut shirt walks up, catching Bash and J's attention. She smiles at Bash and J as she walks by while the two are sitting on a porch with other men playing instruments. Bash and J watch the events in their car while jamming. Sitting on the porch, Bash and J throw peace signs to two other ladies who walk by. The neighbor girl upstairs throws down a flower to J, he smiles and throws a peace sign. A telephone repair woman dancing credited as the Call Girl catches the eye of Bash, he dances with the Call Girl. A police woman holding a stop sign, lets two woman wearing low cut school uniforms cross the road, all three then proceed to flirt with Bash and J. Bash pretends to paddle the police woman with her stop sign. On a street called Groovy Way, an ice cream woman dances with Bash. Bash walks the street dancing with other women and then dances with a female DJ. At a lounge, Bash, J and other women dance. After watching the events in their car, it is shown Bash and J are escorting three women, whom are in the back seat. ^ ascap.com. Suga Suga - Baby Bash Retrieved 11-19-2010. ^ Renck, Lizzie (19 July 2015). "Robin Schulz unveils 'Sugar' ahead of his fall LP release". Dancing Astronaut. Retrieved 20 July 2015. ^ Gupta, Pranav (20 July 2015). "ROBIN SCHULZ FT. FRANCESCO YATES – SUGAR (ORIGINAL MIX)". Bangin Beats. Archived from the original on 20 July 2015. Retrieved 20 July 2015. ^ "Australian-charts.com – Baby Bash – Suga Suga". ARIA Top 50 Singles. ^ "Austriancharts.at – Baby Bash – Suga Suga" (in German). Ö3 Austria Top 40. ^ "Ultratop.be – Baby Bash – Suga Suga" (in Dutch). Ultratop 50. ^ "Ultratop.be – Baby Bash – Suga Suga" (in French). Ultratop 50. ^ "Danishcharts.com – Baby Bash – Suga Suga". Tracklisten. ^ "Lescharts.com – Baby Bash – Suga Suga" (in French). Les classement single. ^ "Musicline.de – Baby Bash Single-Chartverfolgung" (in German). Media Control Charts. PhonoNet GmbH. ^ "Nederlandse Top 40 – Baby Bash" (in Dutch). Dutch Top 40. ^ "Charts.nz – Baby Bash – Suga Suga". Top 40 Singles. ^ "Polish Airplay Charts - Lista krajowa 27/2004". PiF PaF Production. Archived from the original on November 6, 2004. Retrieved April 17, 2019. ^ "Swedishcharts.com – Baby Bash – Suga Suga". Singles Top 100. ^ "Swisscharts.com – Baby Bash – Suga Suga". Swiss Singles Chart. ^ "Hot 100: Year End 2003". Billboard. billboard.com. Retrieved 5 February 2016. ^ "Hot 100: Year End 2004". Billboard. billboard.com. Retrieved 5 February 2015. This 2000s hip hop song-related article is a stub. You can help Wikipedia by expanding it.